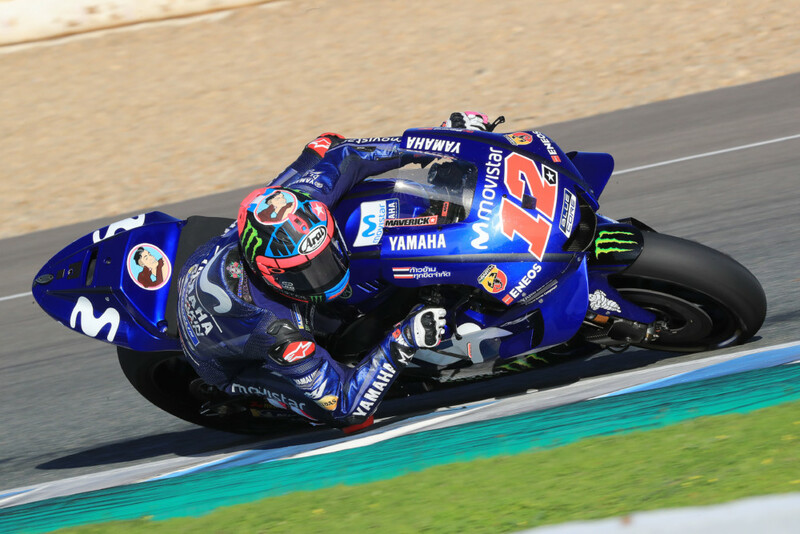 2019 Jerez MotoGP Test Day Two Results—Close times and a surprise name at the top of the list brought the final day of testing before the winter break to a close at Jerez today. The ultimate lap record remained intact by just three tenths but the race record was comprehensively smashed. 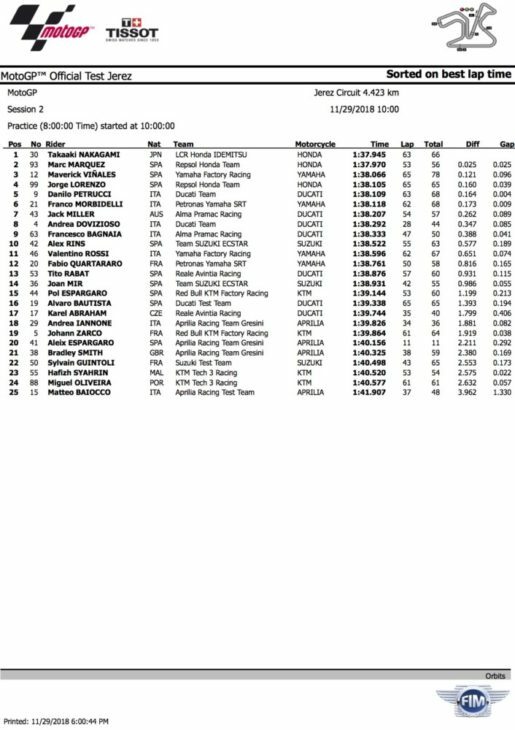 Nakagami took Crutchlow’s bike for this test and went straight to P1 on Day Two. Top of the list? 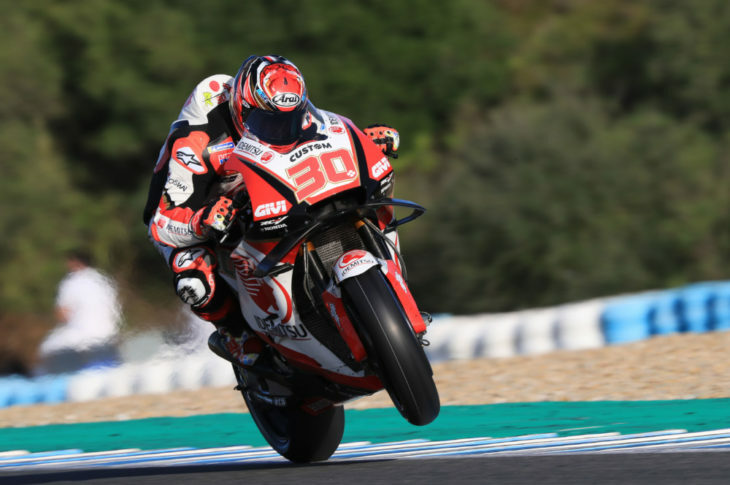 None other than 2018 rookie Takaaki Nakagami, thrilled with his chance on the factory bike, ridden all year by absent and injured senior LCR team-mate Cal Crutchlow. The Japanese clocked a time of 1:37.945 today, just 0.025 of a second ahead of champion Marc Marquez (Repsol Honda), who placed second. Marquez was riding with familiar abandon, testing engine, and chassis upgrades. 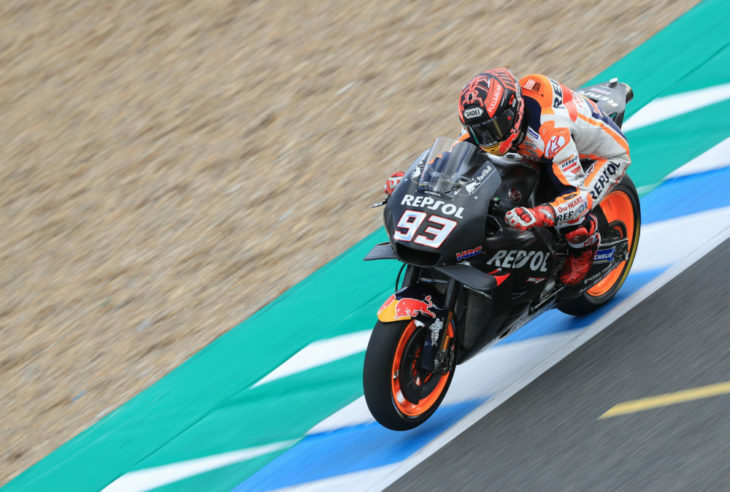 Another surprise was that his new teammate Jorge Lorenzo was only 0.135 of a second slower than Marquez, marking a rapid adaptation from Ducati to Honda, in spite of being less than fully fit, after his late-season arm injuries. Lorenzo looked comfortable on the Honda, riding more aggressively than he ever looked on the Ducati or the Yamaha before it. Marquez was at the pointy end, as usual. Lorenzo’s RC213V has bodywork modifications including a wider seat and enlarged dummy tank cover, as used on the Ducati. He placed fourth but in between the Repsol pair was Movistar Yamaha’s Maverick Vinales, making the most of the better of the two engines Yamaha had brought. The riders needed to decide on engine choice, and while Valentino Rossi affirmed this had been done, placed 11th today, he was clearly disappointed. “We have a lot of work to do in all areas if we want to be competitive with Honda and Ducati, and also Suzuki,” he told Dorna’s cameras. Day one’s leader Danilo Petrucci (Ducati) was fifth today, but his time yesterday was enough to make him second overall. Vinales completed a happy test for his side of the Yamaha garage in third today. Top rookie Francesco Bagnaia (Pramac Ducati) was impressive again, placed ninth today and overall. Next came Alex Rins on the better of the two Suzukis, with new teammate Joan Mir an impressive 14th. Rossi was ahead of another rookie, second Petronas Yamaha rider Fabio Quartararo. An impressive 13th went to returned Tito Rabat (Avintia Ducati), back after a long layoff following his Silverstone injury. KTM, with a huge pile of parts including several chassis to test, were still lagging. Pol Espargaro placed 15th; and new team recruit Johann Zarco was down in 19th, 1.9 seconds down.